/// into another data type. // Creating the repository objects to work with. // Comprehension query showing how to join database data and create an anonymous type. // Query that joins the movie table to the reviews table and creates an anonymous type. 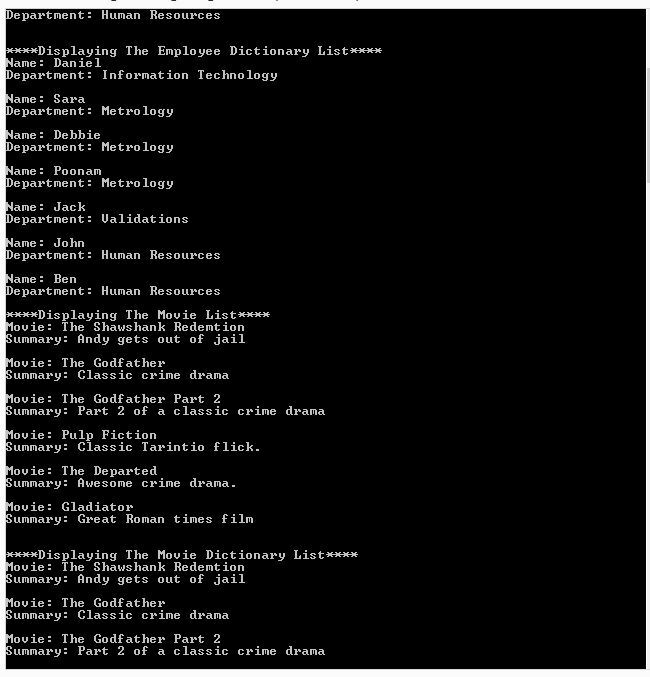 // List and Dictionary collections. // Queries that keep from having to perform a separate foreach loop to convert into a strong type. // I just need a loop to add the objects to the collections. // Write methods to display the results of the greedy variables. In this example I’ll be demonstrating a few ways to use the GroupBy and ToLookup LINQ keywords in some queries. I’ve divided this up between three methods. One method showing a basic GroupBy example. The second method showing examples on some in-memory data. And the third example on some database data. I went a little nuts on this simple console program. I wanted to demonstrate different ways to use the Join operator with in-memory objects from a collection and pulling information from a database. In the process of wanting to leverage anonymous types in the query I was playing around with different ways to display the data. Do I just iterate thru the query and display it. Or do I take that data, create objects, and populate another collection type with the data. Again, your personal preference might be different. I was just playing around with what ways would work. I broke the code up into different repositories for the in-memory data and database data. I also created a WriteResults method in an attempt to use a central class to display data. I know lots of work for a simple console program. 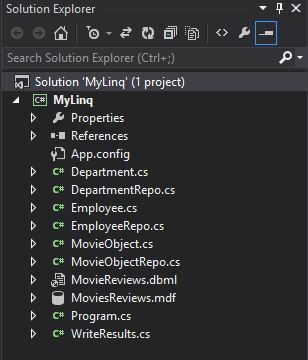 However I think it shows some cool core concepts with LINQ queries. You will notice that the one common class that’s the same from other examples is the Employee and Department classes along with their respective repository classes. I’ve added a couple more for the database data which I’ll go over below. This is something I’ve run across now and then. In some cases you may find someone who decides to stick a bunch of different types in a collection. Now I’m a big proponent of using strongly types object, collections, etc… However I know not everyone does that. Or there might be a situation where it didn’t happen that way. Here’s one of many ways that you can use a LINQ query to extract different kinds of data from an abstract collection.